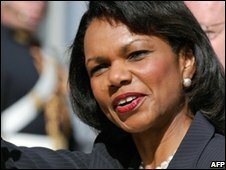 US Secretary of State Condoleezza Rice has signed a deal to base part of Washington's controversial missile defence system in the Czech Republic. The deal, signed in Prague, allows a tracking radar base to be set up. The plans remain unpopular in the Czech Republic and the US has also failed to reach agreement with Poland on housing other parts of the system there. A senior Russian official has been quoted as saying the deal "complicates" global security. Moscow has previously threatened to aim its own missiles at any eventual base in Poland or the Czech Republic. Ms Rice said that she had earlier held constructive talks with Poland's foreign minister, but declined to predict whether the US and Poland would reach an agreement. "We have told them what we can do... There are still some issues, so I can't say for certain what the trajectory is, but it was a constructive meeting," she said after talks on Monday with Radek Sikorski in Washington. In the first reaction from Moscow, an unnamed senior foreign ministry official quoted by Interfax news agency said that the US-Czech agreement did not enhance security but "complicates security issues on a global scale". The missile defence system would include the tracking radar system in the Czech Republic and 10 interceptor missiles in Poland. The US wants the sites to be in operation by about 2012. A second deal covering the status of US soldiers at the Czech base has not been agreed. Czech opposition parties have strongly criticised the plans and are calling for a national referendum. The plans would have to be approved by the Czech parliament, where the government would need the votes of the opposition parties to get them through. Jan Majicek, of the No Bases Initiative, said that more than 100,000 people had signed a petition against the Czech base.